Shop in style in our amazing showroom. It is filled with a large selection of jewelry to meet all your needs. Classic to modern and everything in between. There is something for everybody. We carry a large selection of engagement rings that will make your day even more special. The Robert Demeglio collection is one of our most popular products. A name you know and trust! Come see us today for all your fine jewelry needs. Let Stardust Jewelers design a one-of-a-kind piece of jewelry for that special occasion. Stardust Jewelers in Mendon exceeds expectations in jewelry sales, service and design. Visit today! One of our most affordable products that keeps you in fashion. A stylish gift for that special someone. 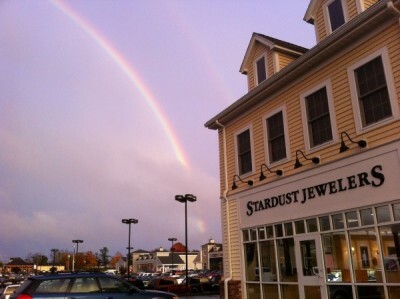 Stardust is a trusted family jeweler since 1978. With high quality gemstones and Diamonds set into precious metals such as Platinum, Gold, and Silver, you’re sure to find the perfect piece of jewelry for yourself or that special someone. Stop by Stardust Jewelers in Mendon today to browse beautiful collections from around the world, or to have your existing jewelry appraised or repaired by one of our Master Jewelers that can do on site repairs and refinishing. 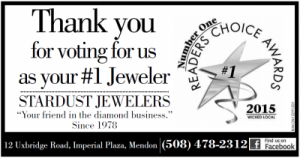 Come to Stardust Mendon for a Jeweler you can trust! Don’t forget to ‘like’ and review us on Facebook! Stay up to date with store news, hours, and custom design projects. We are here to serve the residents of Mendon, Milford, Hopedale, Bellingham, Franklin, Uxbridge, Blackstone, Northbridge, Sutton, Douglas, Upton, Holliston, Hopkinton, Westboro, Grafton, Millbury and all other surrounding towns. Visit us for all your jewelry needs. We will be closed for April Vacation, (Monday, April 15th - Monday, April 22nd). We will reopen Tuesday, April 23rd with our normal business hours.